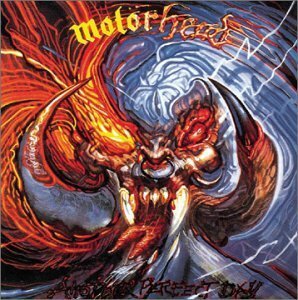 Another Perfect Day is the sixth album by the British band Motörhead. The album was released in 1983 and reached number 20 in the UK charts. After guitarist "Fast" Eddie Clarke left Motörhead on their second US tour, Brian "Robbo" Robertson (ex-Thin Lizzy, Wild Horses) was drafted to complete the tour. On their return to the UK the band recorded their unique and controversial album - Another Perfect Day. After this album Robertson and Phil "Philthy Animal" Taylor left to form the band Operator and Lemmy went on with Motörhead, forming the new line-up of Lemmy, Phil Campbell, Würzel, Pete Gill. None of the songs from the album were performed live after Robertson's departure in 1983 until 2004. Since then, "Shine", "Dancing on Your Grave", "I Got Mine" and "Another Perfect Day" have been featured in the band's live set. The original vinyl release has a lyric-sheet insert, with a cartoon storyboard of the adventures of the new band, as it were. In 1988 Castle Communications re-issued this album along with Overkill – in a gatefold sleeve. The thrash metal band Sepultura named themselves after the third track from this album, "Dancing on Your Grave". The songs "Back at the Funny Farm" and "Marching Off to War" were featured on the video game Brütal Legend.